Last week about 20 volunteers, including myself, braved some nasty New York weather to participate in Story Love! at the CFK office after hours. These sessions, which occur three times a semester, provide an essential and direct connection between CFK’s supporters and the kids we serve. 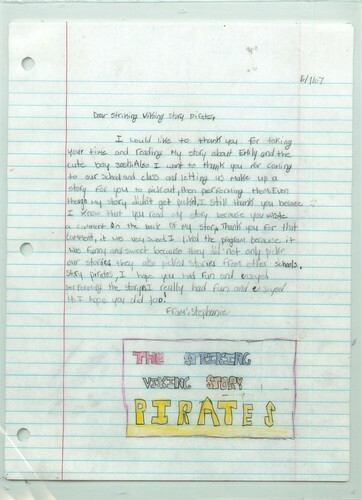 Not every story written can be performed by the Story Pirates before the schools, but every one should certainly be acknowledged. That part was up to us. Our instructions were to do the following: let the kids know that they did a great job, comment on a particular detail, and mention what we might want to see more of next time. The more specific our comments the better, as it gave a personal touch. That wasn’t very difficult, of course. Who wouldn’t comment on a dark blue monkey that shoots bananas? Or a game of cheese chess? I want to know more! My personal favorite, which I read aloud–much to the amusement of my fellow tablemates–was a well-thought out, redemptive tale of stealing candy, lying about it and confessing to the deed at the end. It had themes of suspense, realism (ok, maybe the cops being called 108 times for the candy theft was a little excessive), flawed humanity and redemption. In the end, the girl never ate candy again—only vegetables. When I read this story I thought to myself, “And this one didn’t make it in!” It just goes to show that it’s important to acknowledge all of the stories, and not just those that make the cut. That acknowledgment makes a world of difference. 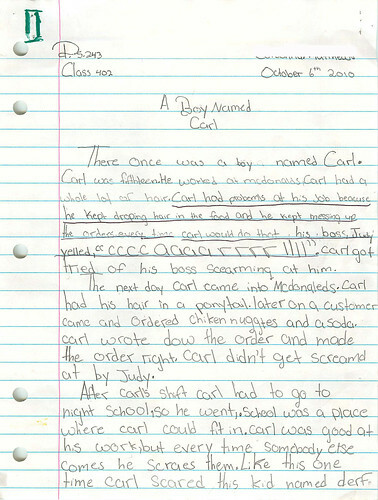 Story Text: There once was a boy named Carl. Carl was fifthteen. He worked at McDonald’s. Carl had a whole lot of hair. Carl had problems at his job because he kept droping hair in the food and he kept messing up the orders. Every time Carl would do that, his boss, Judy yelled, “CCCCAAAARRRRLLLL.” Carl got tired of his boss screaming at him. The next day Carl came into McDonaled’s. Carl had his hair in a ponytail. Later on a customer came and ordered chiken nuggtes and a soda. Carl wrote dow the order and made the order right. Carl didn’t get screamd at by Judy. After Carl’s shift Carl had to go to night school, so he went. School was a place where Carl could fit in. Carl was good at his work, but every time somebody else comes he scraes them. Like this one time Carl scared this kid named Derf so bad he mad him run around the whole school. 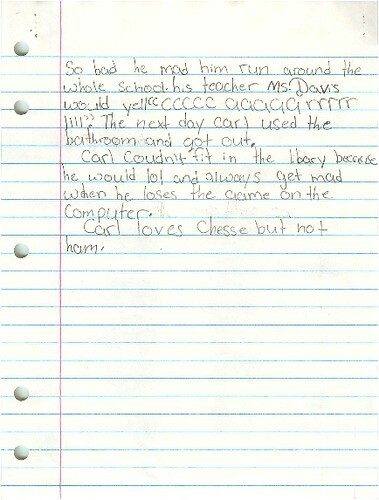 His teacher Ms. Davis would yell “CCCCCAAAAARRRRRLLLLL.” The next day Carl used the bathroom and got out. Carl couldn’t fit in the libary because he would LOL and always get made when he loses the game on the computer. Carl loves chesse but not ham.